Item. 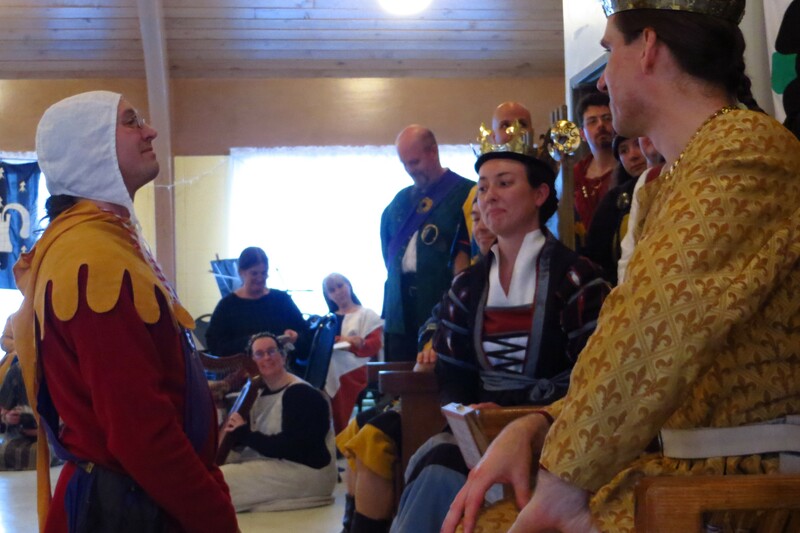 Her Majesty called forth Lorenz Greylever and endowed him with the Queen’s Order of Courtesy for his good works and noble bearing, the which deed was confirmed with a document created by Nest verch Tangwistel. Item. 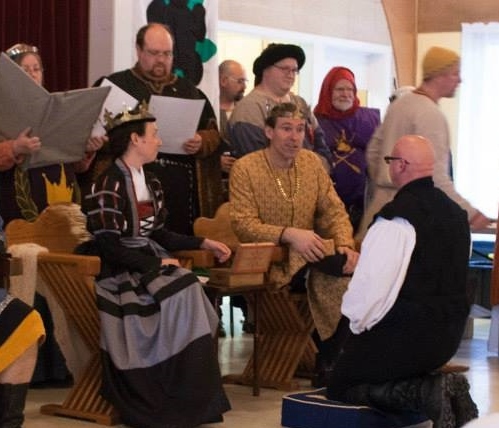 Their Majesties summoned before the Court their good servant Malcolm Bowman and set the question before him whether he would join the Order of the Pelican, answer to be given later that afternoon. Item. Their Majesties recognized the children who had participated in the Children’s Service Initiative. Item. 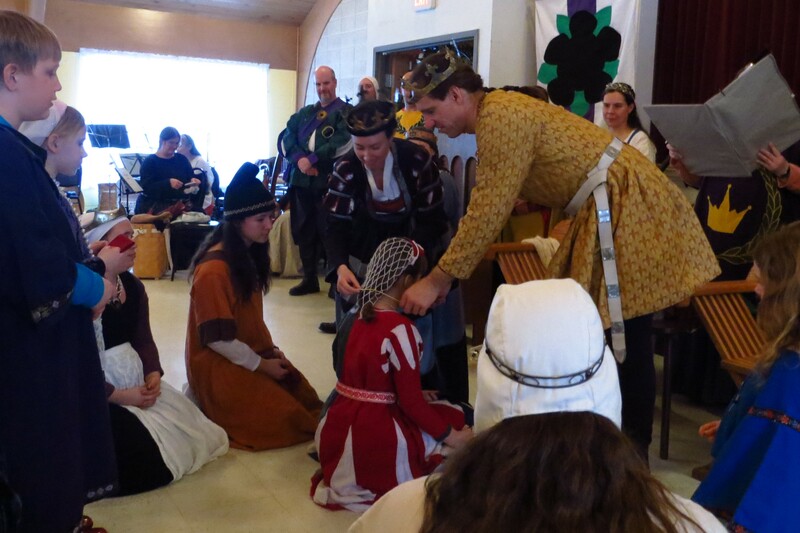 Their Majesties invested Kathleen of Anglespur with the Order of the Tyger’s Cub, the which deed was memorialized with a document authored by Ulrich Reinhart and calligraphed and illuminated by Sorcha Dhocair inghean Ui Ruairc. Item. Their Majesties made gifts of sweets to the children of the East. Item. Their Majesties summoned Fiónán MacLeóid of Armagh before the Court and awarded Arms to the said Fiónán, the which deed was confirmed in a document calligraphed by Bebhinn inghean Ui Siodhachain and illuminated by Ruaidhri Mac Crimthainn. Item. Their Majesties bade Katharine of Kyngesbridge to attend upon them and thereupon awarded her Arms, the which deed was confirmed in a document created by Bebhinn inghean Ui Siodhachain. Item. 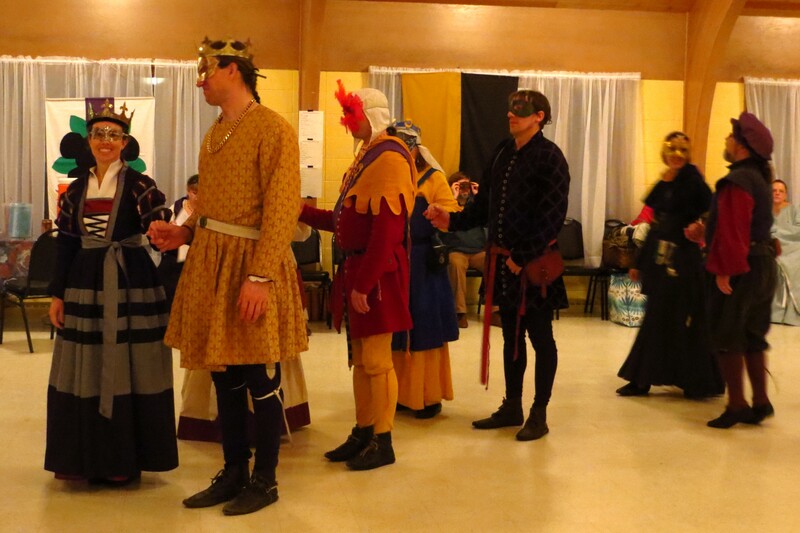 Their Majesties inducted Harvey Wynegode into the Order of Terpsichore, the which deed was memorialized with a document calligraphed by Nest verch Tangwistel and written and illuminated by Lorita de Siena. Item. 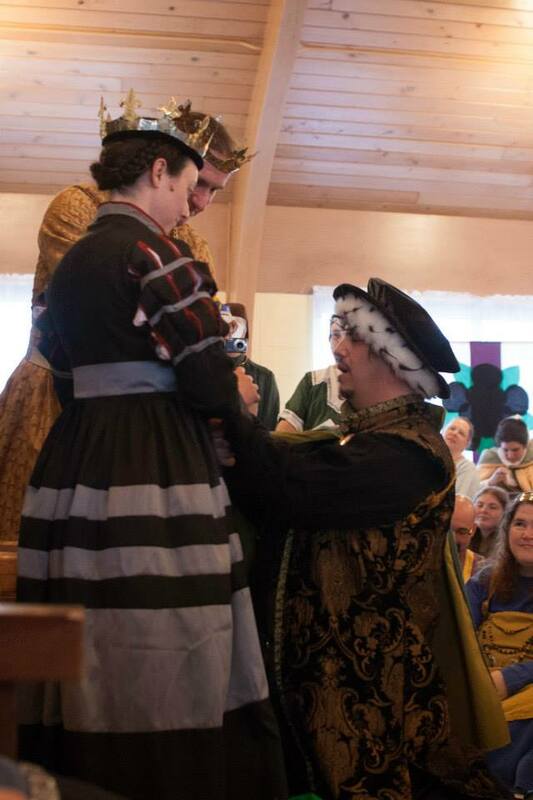 Their Majesties bade Karrah the Mischievous to appear before the Court, and thereupon inducted her into the Order of Terpsichore, the which deed was confirmed in a document created by Katherine Stanhope. Item. 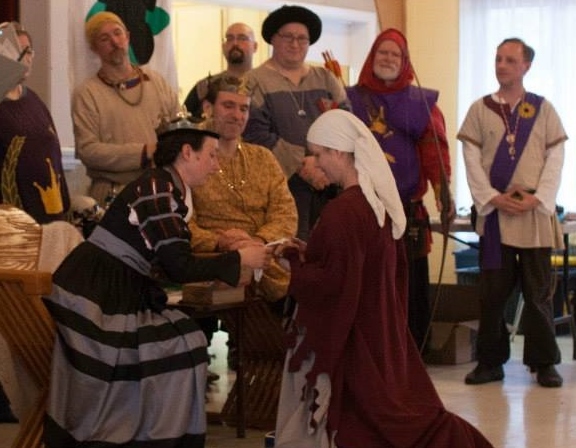 Their Majesties summoned Faelan Mac Lochlainn before the Tyger Thrones and, praising his skill with a blade, inducted him into the Order of the Silver Rapier, the which deed was confirmed in a document created by Aesa Sturludottir. Item. Her Majesty endowed Matilda of Carolingia with the Queen’s Order of Courtesy, the which deed was memorialized in a document calligraphed by Nest verch Tangwistel and illuminated by Robert of Stonemarche. Item. Her Majesty summoned Fortune Sancte Keyne before the Court and, acknowledging her many good works, endowed the said Fortune with the Queen’s Queen’s Award of Esteem. Item. Their Majesties summoned Malcolm Bowman to answer the question put before him that morning; and further heard testimony from good and honored Peers of the Realm as to the said Malcolm’s virtues and good works; and so hearing and so finding, Their Majesties inducted the said Malcolm into the Order of the Pelican, the which deed was confirmed in a document authored by Alys Mackyntoich and calligraphed and illuminated by Nataliia Anastasiia Evgenova.